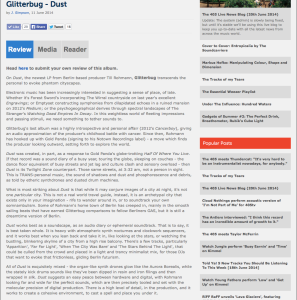 Almost 9 months after the international release of Glitterbug’s current and internationally praised album, Dust, out on Gold Pandas NOTOWN Recordings and Glitterbug’s own c.sides imprint, some Glitterbugs dear friends gathered to provide their interpretations of ‘Far Far Light’, one of the stand out tracks of the album. The original version of Glitterbugs ‘Far Far Light’ settles in a rather solemn mood, presenting the listener with deep bass lines, wet reverbs and sparse arpeggios. ‘Far Far Light’ is a hypnotic, dark and spellbinding journey across nightly streets and forgotten urban landscapes. Extrawelt (of Cocoon and Border Community, to name just a few) fill raves and large scale clubs and festivals internationally, and that is for a reason. Their interpretation of ‘Far Far Light’ unstoppably creeps into the raver’s heart, soul and body, making the already dense original even denser and adding an ever evolving, powerful, dark and excessive atmosphere that keeps on climbing and building until the very last chord of their remix. Estroe is no foreigner to the techno and electronica circuit either. The Dutch DJ and Producer, with a prolific history in both of her fields, has been a dear friend of c.sides and Glitterbug for many years. Her unique moods and the depth in her production, as well as the emotionality in her DJ sets and the music she writes and produces, is something that speaks a mutual language and shares similar musical vocabulary. Her remix creates a version of ‘Far Far Light’ that floats into a melancholic and partially gloomy, yet friendly and loving universe. c.sides own Biblo, hailing from Istanbul and who just released ‘Absence’, her latest album, on the c.sides imprint, takes all the gloom and heaviness of the original track and adds her own sonic pallet, creating a dark and earth shattering interpretation of ‘Far Far Light’. Witch House meets deep dub techno meets eerie vocals meets Glitterbug. Prepare for a journey far down below. A few weeks ago, we had the honour to perform at the great Ritournelle festival in Munich, alongside amazing artists like Koreless, the James Holden Band, To Rococo Rot, and John Talabot. They made a wonderful video of the event, and it very nicely captures some great moments of a fantastic night. Thank you guys so much for having us! This review by the nice people of Uncool Magazine has been online for some time, but I only found it now. You can find the original post here. Cuando sientes algo tan fuerte que necesitas materializarlo y esa forma de materializarlo es a través de la música salen discos como Dust. Dust es el álbum que el alemán Glitterbug lanzó la semana pasada con el sello Notown de Gold Panda. Cuando lo escuchamos nos enamoró, después cuando leímos la explicación del artista sobre los temas y sobre qué había sido lo que le había inspirado e influenciado en el proceso de creación del disco entendimos el por qué de que nos calara tan hondo. Se palpa en las primeras canciones del disco. Música experimental que tiene cambios poco predecibles a lo largo que avanza el álbum donde se intuyen los diferentes y dispares estados de ánimo que el autor atraviesa a lo largo de la producción terminando con unos sonidos techno muy suaves. Aquí os dejamos su nuevo disco! disfrútenlo! I am deeply grateful for this interview / feature that was just published by the British magazine The Skinny in their July issue. 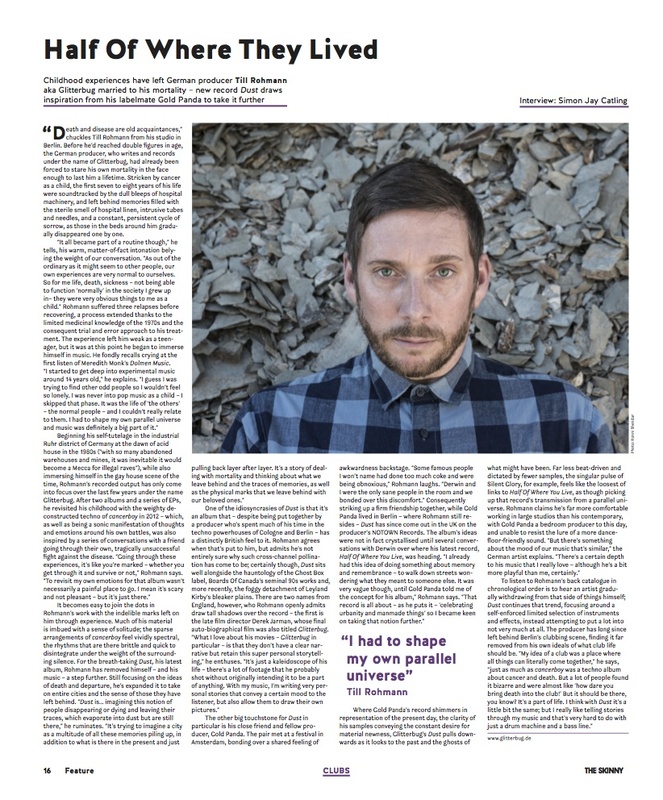 Thanks to Simon Jay Catling first and foremost for a wonderful article, and also the long, interesting conversation we had about my music. It’s always wonderful to learn something new about what you do through sincere conversations with like-minded people and their perspective on your work. You can also read the PDF of the print version here. “Death and disease are old acquaintances,” chuckles Till Rohmann from his studio in Berlin. Before he’d reached double figures in age, the German producer, who writes and records under the name of Glitterbug, had already been forced to stare his own mortality in the face enough to last him a lifetime. Stricken by cancer as a child, the first seven to eight years of his life were soundtracked by the dull bleeps of hospital machinery, and left behind memories filled with the sterile smell of hospital linen, intrusive tubes and needles, and a constant, persistent cycle of sorrow, as those in the beds around him gradually disappeared one by one. 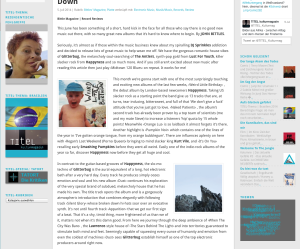 FEATURE BY SIMON JAY CATLING. The friendly people of Titel Kultur-Magazin have been very kind to me and sent Mr. John Bittle my way. Or the other way around? Regardless, his words made me giggle and very very happy. 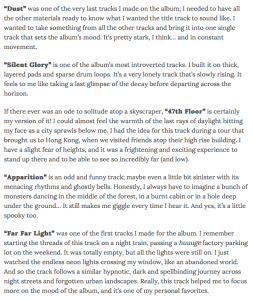 Nobody had found such nice words for ‘Apparition’ (one of the tracks on Dust) yet… but read for yourself, and don’t miss the rest of the reviews to be found here! The slo-mo techno of Glitterbug is the aural equivalent of a long, hot electronic bath after a very hard day. Every track he produces simply oozes emotion and soul and his new album ›Dust‹ continues his exploration of the very special brand of subdued, melancholy house that he has made his own. The title track opens the album and is a gorgeously atmospheric introduction that combines elegantly with following track ›Silent Glory‹ whose broken down hi-hats soar over an evocative synth. It’s not until fourth track ›Apparition‹ that we get our first sign of a beat. That it’s a shy, timid thing, more frightened of us than we of it, matters not when it’s this damn good. From here we journey through the deep ambience of ›When The City Was Bare‹ , the Lawrence-style house of ›The Stars Behind The Light‹ and into territories guaranteed to stimulate both mind and feet. 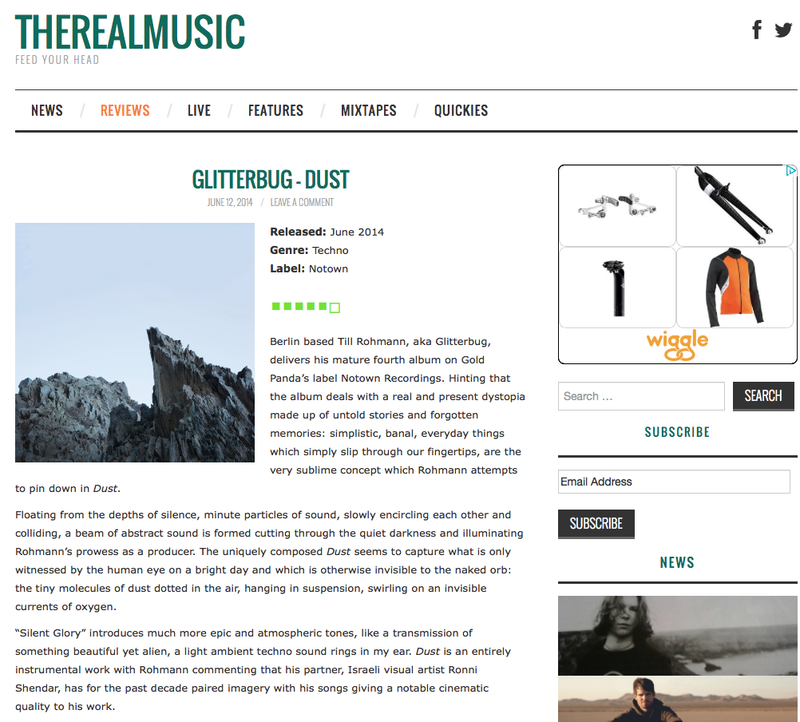 Seemingly capable of squeezing every ounce of humanity and emotion from even the coldest of machines ›Dust‹ sees Glitterbug establish himself as one of the top electronic producers around right now. Inverted Audio has been super supportive and very kind to my album. On top of all the lovely things they posted and shared about Dust, they asked me to record a new exclusive podcast for them, and they also did a super long interview. All of that below, or you pay them a visit read it all on their very pretty website. Last week Berlin based producer Glitterbug released his new album ‘Dust‘ on Gold Panda’s NOTOWN imprint. We were so impressed with the album that we invited him to record a mix and discuss the album in detail. YOU’VE JUST RELEASED ‘DUST’, CONGRATULATIONS! WHAT KIND OF FEEDBACK HAVE YOU BEEN GETTING BACK SINCE IT WAS RELEASED? Thaaaaanks!!! Thankfully, the press has been overwhelmingly positive throughout. I mean there are always some reviewers that don’t really get it, get some facts wrong, make weird comparisons or just write poorly… but those are a total exception, and it’s been amazing! The attention is definitely not bothering at all – on the contrary. You sit in the studio for a year or more writing an album, then you wait for the mastering, graphics and final product to be printed – during this long period, all the feedback one gets is from the label, a few close friends and collaborators, but it’s impossible to get a sense of how it will be received. That’s a super nerve-wrecking period. To then have your album released to the world and to see that people can relate to it, and specifically to read what they see in it and where it touches them is super rewarding. I am very grateful that Dust gets this much attention. Considering the amount of music that’s released every week, even in my little musical niche, I am unbelievable fortunate to have this many publications write and speak about it! As far as letting that shape my music – no, not at all. In early Glitterbug years, when I was still a bit lost and didn’t really have a fully developed sense of artistic direction yet, I sometimes tried to make music that would sound more like this or that, just to be able to fit somehow and somewhere. But during the period of producing my first album, ‘Supershelter‘, I realised that the only person I can be is actually myself (radical realization, I know…), and that I also can’t change who I am when I am making music. So, for the good and bad – even if I wanted to let public taste and opinion shape my music (which I absolutely don’t), I couldn’t. Being Glitterbug is my biggest stronghold and weak point at the same time, and there is absolutely nothing I can do about it. CAN YOU TELL ME ABOUT THE CONCEPT BEHIND THE ALBUM? WHAT DO YOU THINK IT REPRESENTS? Well, in a way it’s both a sequel to my previous album, ‘Cancerboy‘, and since I also conceptually wanted to do something that’s relevant for Notown, I also looked at Gold Pandas last album and took some of the notions of ‘Half Of Where You Live’ to take them a step further and to knit my own stories into the fabric. I wanted to make an album about remembrance and remains – both in a sense of people and things that were, stories of lives that were lived, the life that filled places before us, about urban shadows and leftovers of the things that were. That’s also where the album title, ‘Dust’, stems from. Cancerboy, by the other hand, was an autobiographical album about life, death, sickness and me and my friend’s personal struggles with cancer. It’s actually an album that I wrote for dead friends, about the stories and experiences that will bind us together forever. Dust peaks into the shadows and tries to catch a glimpse of what once was. We all have our own personal maps and memories of our surroundings, especially when we lived in the same place for some time. Just imagine the multitude of memories of all humans that once lived in one building, street, city, and try to put that on top of present life. This was the idea behind Dust. The moodiness and visual qualities of my music for sure have their roots in my past- I was very sick for most of my childhood and definitely marked for my entire adolescence and adult life. I stood out as a very odd being, and I can’t say that I had a very functional family either (both my parents were artists and not very good at parenting, to say the least). Not being happy with your place in life, being an outsider in school (and so forth) pushed me further towards art and music and alternative forms of expression as well as venturing off to imaginary worlds that often felt more welcoming than the real world. I imagined very lonely places mostly filled with friends from the hospital times that passed along the way. I still feel very at home in these places, and they always shine through the surface of my music I guess. The listener can often feel that abyss underneath it all I suppose. TELL ME ABOUT YOUR ALBUM WRITING PROCESS? WHERE DID YOU SPEND THE MAJORITY OF YOUR TIME WORKING ON THE ALBUM AND WHO WITH? I started writing Dust when I was still living in Cologne, during my very last months there. I already had left my old studio (the lease had ended), and moved to an intermediate temporary place in a friend’s house (he had a huge 2 story apartment in terrible shape, and he didn’t know what to do with the top floor – so I made it into a studio for a few months), and then I moved to Berlin. Finding a studio here was actually very difficult, and I was forced to build a basic, temporary studio at home, something I haven’t done in like 10 years or so, and I was reminded why. I hate waking up and to look at my workspace!! I then found a nice studio that I share with Murat Tepeli, one of my closest friends, and my long-term collaborator and one of my favourite visual artists (and humans) on this planet, Ronni Shendar. So Dust is in fact a true studio album, there wasn’t much traveling involved, just moving studios three times along the process…. I’m sure all that packing, unpacking and moving was also an influence, as it forces one to also pack memories and re-examine places and their meaning. I work on music pretty much in solitude. I’ve worked in band and ensemble contexts in the past, but it’s not necessarily for me. The fact that I sink very deep into the mood of my music makes me rather socially incompatible with most other humans during production times. So there wasn’t much else I did during that entire period. I also can’t really listen to any other music when I produce. So I’m not only thrilled to be back to social life, but especially enjoying discovering new music. DO YOU HAVE A FAVOURITE TRACK? IF SO, WHICH ONE AND WHY? I LIKE ‘47TH FLOOR’ – IT SOUNDS A LOT LIKE BIG BEN. How can I tell you which my favourite is without upsetting the others? No, but seriously, I don’t really know. After I’m done with an album, it’s usually all a big blur and they all become one big blob in my head. Tracks that stick out for me are ‘Far Far Light‘ for its simplicity, moodiness and minimalist production. ‘47th Floor‘ is a very special one indeed; more of a miniature rather than a full track, and it’s funny that you think that it sounds like Big Ben… I guess I haven’t been to London in too long, I had to Google the sound to remind myself the tonality (and that made me remember that my English teacher in school made us stand up before class and have us sing “Good morning Miss Klein – Miss Klein, Good Morning! In the Big Ben melody)… I also really love ‘The Stars Behind The Light‘ for its despair. WHEN DID YOU DECIDE TO RELEASE AN ALBUM ON GOLD PANDA’S LABEL NOTOWN? WHY NOT JUST SOLELY UNDER YOUR C.SIDES IMPRINT? Well, we wanted to do something like this for quite some time, and I guess it was a logical step in the evolution of our labels and music to do this eventually. Derwin at first asked me if I’d like to do an EP for Notown, and I took the entire arm rather than just the little finger (can one say this in English?) and asked him if I could make it into an album… he had to say yes because he is one of the nicest and most polite people I have ever met! Just kidding. 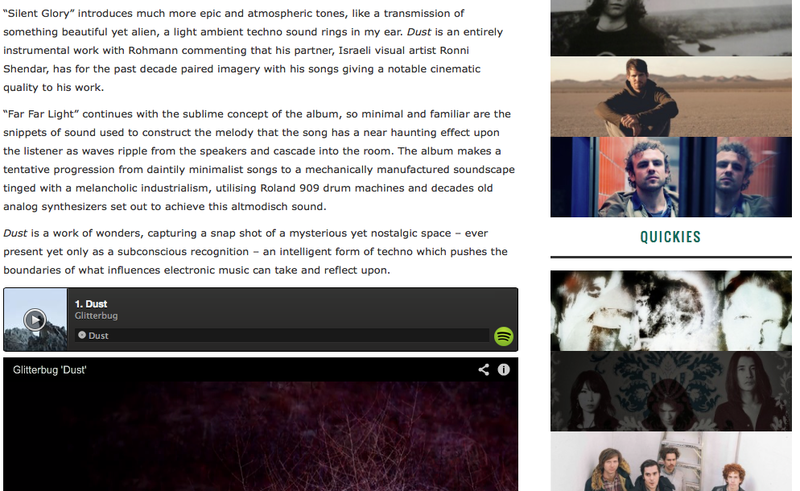 c.sides is a lovely platform and I am super excited about further projects on the label. Up next is a split EP of Jasmine Monique Guffond aka Jasmina Machina and Turkish supertalent Biblo, and the next Biblo album after that. But it’s also great to have new platforms for your art sometimes, and it’s very nice of Notown to lend me their stage for my music. To always release on your own imprint is lovely, but also limits you to preach to the same choir and to convince the convinced over and over. I hope that through Notown I am able to reach new people with my music that probably haven’t heard of me before, and that’s just wonderful. WHEN DID YOU FIRST MEET DERWIN AND HOW DO YOU COMPARE YOUR MUSIC ALONGSIDE HIS? Derwin and I met in a festival in Amsterdam in… I think it was in 2009 or 2010. It was slightly before Gold Panda went on that incredible sky-high ride of success with his music, and we were stuck in a backstage with some incredibly famous people that were annoying as hell and that we both tried to ignore. So there was us, intimidated by and totally uncomfortable with the situation, and we started chatting because that was definitely something we had in common, but we only introduced ourselves with our first names, not our artist names. Derwin then picked up the program and was like: damn, do you know if Glitterbug played already? I really wanted to see him! And I had to answer that yes, we were on yesterday, and hey, that Glitterbug, that’s me! That’s where our friendship started. We both don’t fit into that strange music business all too well, and we both always feel a bit like the odd ones in class. Which we are, I suppose. And that’s one of the reasons we love each other so much. Derwin and I write and produce music very differently. But where we definitely meet, and in my opinion that’s the most important element in music, is in the mood and atmosphere. We are both quiet sensitive, melancholic and moody people, and that is mirrored in the music we make. TELL ME ABOUT THE TIME YOU SPENT IN CALIFORNIA WITH RONNI SHENDAR SHOOTING THE VIDEO FOR DUST? I CAN IMAGINE YOU SLEEPING UNDER THE STARS IN A TENT…BUT I FEEL THIS IS FAR BEYOND THE REALITY ON WHAT ACTUALLY HAPPENED. Oh, shooting in an all-outdoor setting during that period of the year in that area is not so easy, maybe even life threatening… temperatures can get below -20°C at night, with days hot and dry. There’s up to 40°C difference between day and night. Also, it’s incredibly dusty, and especially with film equipment, one has to be careful to not ruin it. Did I mention the venomous critters that live there? We actually had a great infrastructure and could be out filming during daytime and come back to a warm wooden cabin in the middle of nowhere at sunset. Ronni has some family that lives out there, so we could actually make use of off road buggies to climb up dusty gravel roads into the mountains, and find out about hidden trails for the areas we wanted to film. It was a lot of work, lots of hiking, and lots of carrying equipment- but very rewarding to be able to work in such an incredible environment. And I totally love the outcome. DID YOU ENVISION THIS TYPE OF ENVIRONMENT FOR THE ALBUM? WHO SUGGESTED IT AND WHERE ELSE WERE YOU THINKING OF SHOOTING THE VIDEO? I wanted to have an environment as sparse of human life as possible, and no humans in the video for this particular track. It was clear we wanted to shoot Dust in a desert. Ronni had been to the area before, so she knew exactly where and what she wanted to film, and we had the best local guides. Sadly, we are horribly overwhelmed with work and projects at the moment – but if you stay tuned for a little longer, there will be a second video for a second track of Dust sometimes soon… This time though, it will be strictly urban. HOW DO YOU THINK YOUR MUSIC CAREER WILL PROGRESS FROM NOW ON? Well, that’s pretty hard to foresee. What I learned from the past few years is that one can’t and shouldn’t take anything for granted in this field – and I have no idea what the future will bring and how much I will perform, how big of a demand I’ll have or even if there will be any. I try not to think about that too much and move on, make new music, work on the next album, release music by people I love and admire, and all else is not under my control really. But I love performing! Specifically live with Ronni on visuals, and also as a DJ. It’s an exhausting but rewarding experience, specifically being able to connect directly with an audience and being able to experiment with my music and see it in new light. IT FEELS LIKE A LOT OF PATIENCE WENT INTO THE ALBUM. CAN YOU TAKE ME THROUGH YOUR STUDIO SETUP, WHAT MACHINES YOU WERE USING AND IF YOU HAVE ANY SPECIAL WEAPONS FOR PARTICULAR SOUNDS? Well…. It’s just a studio I guess? I think that equipment is the least interesting, and sometimes can be a huge distraction from the core of it, the actual process of writing and creating music! At least that used to be the case for me- the most equipment hoarding I did when I was the unhappiest with my music. But since you’re asking: I’m a total nut for good audio reproduction, so the first big and important part is proper monitoring. I used my Klein & Hummel O96 monitors for most of the production, but recently upgraded to the wonderful British ATC SCM25’s, which are the best monitors I have ever heard in the near / mid field range. My reference near fields are the good ol’ BBC designed LS3/5a’s, that I have both at home and in the studio, which makes A/B-ing and taking music to different environments a lot easier. As headphones, I use the rather exotic Jecklin Float (QA), that’s an electrostatic model that originates in the 70s, and that to me is unmatched by anything in the market, at any price point. Those were especially important for the album since I had to move my studio several times and had to get accustomed to different, mostly very silly room acoustics- the Floats saved my life and a lot of time because I had a true and trustworthy reference, no matter where I worked and how obnoxious the room acoustics were. Amping for the passive part and the headphones (they do need a power amp) is done through vintage Quad amplifiers, particularly the 405, 520 and a pair of 510 (the latter I am very proud of!). When it comes to instruments, it’s a blend of both digital and analog- I am rather pragmatic about these things. Important were a Yamaha CS15, a Cheetah MS6, Logic Studio, Arturia, a Korg Poly 800, a Jomox Airbase, a Roland 909 & Roland MKS80 (both not mine, but shared with Murat Tepeli), some Dave Smith stuff, a Waldorf Blofeld, a lot of little boxes and strange things from the past 40 years of music equipment… and Universal Audio. I have the UAD Apollo Quad and am terribly in love with it, and the UAD platform is basically all I use when it comes to DAW signal processing. I simply wouldn’t be able to afford the same sound with outboard gear. HOW ARE YOU TRANSLATING YOUR STUDIO SETUP INTO A LIVE SETUP? Nothing too special here either, but it takes up a lot of space and has a lot of pretty flashy lights and knobs and faders as eye candy for the audience and to keep me busy: I do use Ableton as the main hub and sequencer for both midi and audio (but only for live shows, never in the studio), a lot of dedicated controllers, and some outboard instruments, like a Dave Smith Mopho, a Waldorf Blofeld, a Jomox M-Base, a digital sub mixer and some stomp boxes and external FX. I also use Universal Audio live on stage and have both a Satellite and a Laptop card with me on stage. 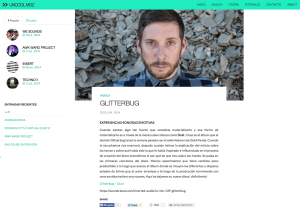 WHAT’S THE STORY BEHIND THE NAME GLITTERBUG AND WHAT IS YOUR MUSICAL HERITAGE BUILT UPON? WHAT ARTISTS AND ALBUMS WERE STILL ARE INTO? Glitterbug stems from the last film Derek Jarman made before he died of HIV. He is (or better, was) one of my most favorite directors and artists out there, and I loved both the name of the film as well as that it was such a personal collage of his life without an obvious narrative. My music is a lot like that I think – you have to grasp intuitively, rather than try to understand it from a rational viewpoint. My musical roots are very versatile, but reach very deep into experimental music and contemporary classical music of the past 100 years, obviously a lot of electronic music of the past 30-40 years with a big crush on Detroit, and so forth… I think the mix I made for you guys reflects that a little. My music is build upon mood, texture, emotion and tension; this is also something I always try to find in the music of other people. Be it Grouper, Meredith Monk, Bela Bartok, Terrence Dixon, Scott Walker, Julius Eastman, Olivier Messiaen, or of very current albums, I was very impressed with the latest of Karen Gwyer and Downliners Sekt – and this is just what immediately sprung to mind, the list is endless- I buy a lot of music, I listen to a lot of music, and I am sure that there are a lot of indirect influences of all these records that I have listened to throughout the years. I actually don’t work with sampling a lot, but in an indirect sense, all this music has travelled with me and influences me, even when I am not aware of it. CAN YOU TELL ME MORE ABOUT YOUR MIX FOR INVERTED AUDIO? The mix spans across quite a few musical directions – it combines friendly ambient (Ezekiel Honig, Colleen) with abyssal experimental music (Biblo, Why Sheep?) and melancholic dub (Downliners Sekt, Fluxion, Mike Dehnert) en-route to a short excursion into hip-hop remix contests (Ghostpoet’s Dial Tones with a lovely remix of friends that obviously didn’t win), and every now and then, it reaches out to old school acid (Mary Velo and Seri (JP)), good ol’ techno (Edit Select, Keith Carnal), the essence of hard-as-a-nail downtempo Avant-Schranz from Frankfurt (the first Sikora-release in years- and what a track that is!) and incredibly deep techno (Murat Tepeli, Tangula, and my own Glitterbug self), reaching out to some of the most wonderful experimental-ish pop I know (Austra, Braids). Or to say it in one sentence: it covers a lot of music and moods that I love from the bottom of my heart. In approximately 80 minutes. And to me, none of these tracks are contradictions, and I think they all make perfect sense together. It sadly doesn’t reach gender parity, but at least it’s 1/3rd female producers in there. It’s a start. The set was recorded ‘live’ in one take, using two Technics 1210 and a vintage Dateq XTC mixer. For tracks that I don’t have or that don’t exist on vinyl, I use one of those silly DJ programs with vinyl control. 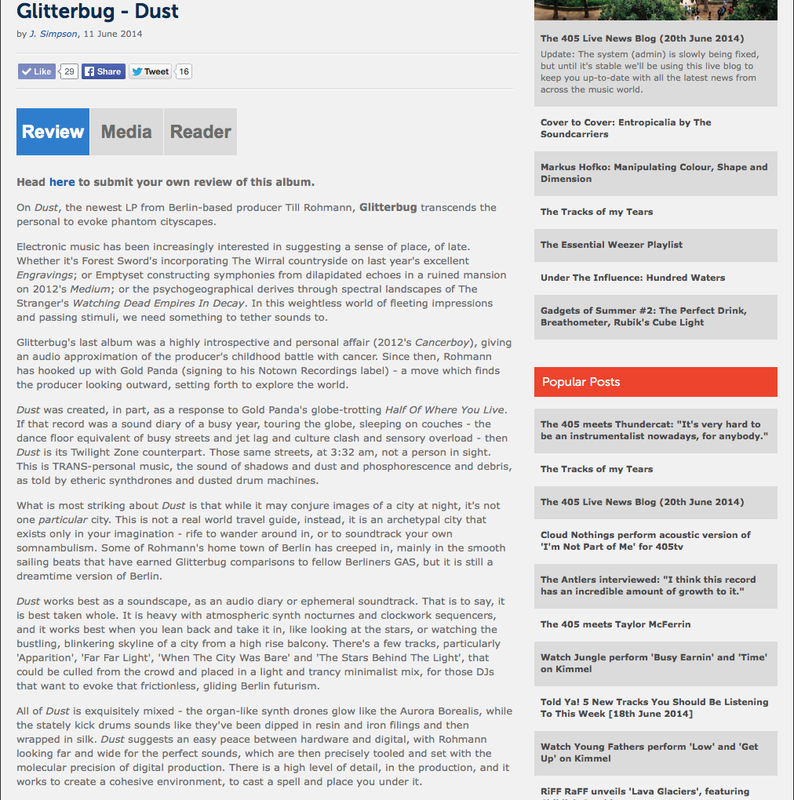 Glitterbug’s new album ‘Dust’ is out now. Buy a copy of the album on vinyl, CD or digital via Bandcamp and iTunes. 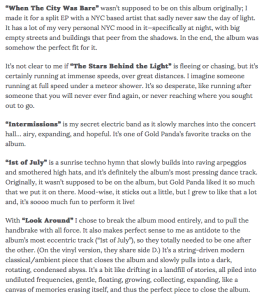 The friendly people of Brooklyn’s self titled mag asked me to write a full commentary to walk listeners through the album. I happily did, and you can read it below, or hop over to the article on their website. I also added the stream on Soundcloud below. “Dust” was one of the very last tracks I made on the album; I needed to have all the other materials ready to know what I wanted the title track to sound like. I wanted to take something from all the other tracks and bring it into one single track that sets the album’s mood. It’s pretty stark, I think… and in constant movement. “Silent Glory” is one of the album’s most introverted tracks. I built it on thick, layered pads and sparse drum loops. It’s a very lonely track that’s slowly rising. It feels to me like taking a last glimpse of the decay before departing across the horizon. If there ever was an ode to solitude atop a skyscraper, “47th Floor” is certainly my version of it! I could almost feel the warmth of the last rays of daylight hitting my face as a city sprawls below me. I had the idea for this track during a tour that brought us to Hong Kong, when we visited friends atop their high rise building. I have a slight fear of heights, and it was a frightening and exciting experience to stand up there and to be able to see so incredibly far (and low). “Apparition” is an odd and funny track; maybe even a little bit sinister with its menacing rhythms and ghostly bells. Honestly, I always have to imagine a bunch of monsters dancing in the middle of the forest, in a burnt cabin or in a hole deep under the ground… It still makes me giggle every time I hear it. And yes, it’s a little spooky too. “Far Far Light” was one of the first tracks I made for the album. I remember starting the threads of this track on a night train, passing a huuuge factory parking lot on the weekend. It was totally empty, but all the lights were still on. I just watched the endless neon lights crossing my window, like an abandoned world. And so the track follows a similar hypnotic, dark and spellbinding journey across night streets and forgotten urban landscapes. Really, this track helped me to focus more on the mood of the album, and it’s one of my personal favorites. “When The City Was Bare” wasn’t supposed to be on this album originally; I made it for a split EP with a NYC based artist that sadly never saw the day of light. It has a lot of my very personal NYC mood in it—specifically at night, with big empty streets and buildings that peer from the shadows. In the end, the album was somehow the perfect fit for it. It’s not clear to me if “The Stars Behind the Light” is fleeing or chasing, but it’s certainly running at immense speeds, over great distances. I imagine someone running at full speed under a meteor shower. It’s so desperate, like running after someone that you will never ever find again, or never reaching where you sought out to go. “Intermissions” is my secret electric band as it slowly marches into the concert hall… airy, expanding, and hopeful. It’s one of Gold Panda’s favorite tracks on the album. “1st of July” is a sunrise techno hymn that slowly builds into raving arpeggios and smothered high hats, and it’s definitely the album’s most pressing dance track. Originally, it wasn’t supposed to be on the album, but Gold Panda liked it so much that we put it on there. Mood-wise, it sticks out a little, but I grew to like that a lot and, it’s soooo much fun to perform it live! With “Look Around” I chose to break the album mood entirely, and to pull the handbrake with all force. It also makes perfect sense to me as antidote to the album’s most eccentric track (“1st of July”), so they totally needed to be one after the other. (On the vinyl version, they share side D.) It’s a string-driven modern classical/ambient piece that closes the album and slowly pulls into a dark, rotating, condensed abyss. It’s a bit like drifting in a landfill of stories, all piled into undiluted frequencies, gentle, floating, growing, collecting, expanding, like a canvas of memories erasing itself, and thus the perfect piece to close the album. 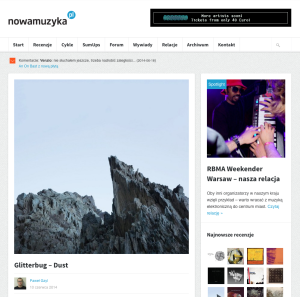 To claim that my Polish is limited would be an exaggeration, but since Google translate speaks a bit of Polish, I tried that and was overwhelmed by all the amazing things that were written about my album. Polish friends confirmed what Google translate had to say- so I am very grateful and very proud and feel very reassured about my music. Thank you Pawel Gzyl! You can find the original article here. Kolejna wyjątkowa płyta Glitterbuga – psychogeograficzna podróż po tajemnicach wielkiej metropolii. Mimo, iż Till Rohmann unika medialnego zgiełku, potrafił zbudować wokół siebie wierną grupę odbiorców, którzy czekają na każde jego nowe wydawnictwo. Niemieckiemu producentowi udało się bowiem połączyć w wyjątkowo ciekawy sposób epickie brzmienia z klubową energią i głęboką emocjonalnością. Takie były trzy jego dotychczasowe albumy – z których ostatni, „Cancerboy”, zaskoczył wszystkich wyjątkowo osobistą tematyką. Po dwóch latach fonograficznej przerwy Glitterbug powraca z nową płytą. Tym razem źródłem inspiracji była muzyka innego artysty. Rohmann zachwycił się nagraniami Gold Pandy z krążka „Half Of Where You Live”, wydanego przez jego własną wytwórnię Notown. Zaintrygowany muzyczną opowieścią o blaskach i cieniach życia w metropolii, niemiecki producent postanowił sam podjąć się realizacji podobnego concept-albumu. W ten sposób powstał materiał na „Dust” – nagrany na analogowych syntezatorach w berlińskim studiu artysty. I znowu mamy do czynienia z wyjątkową pozycją w dyskografii producenta. Dziesięć kompozycji składających się na krążek tworzą spójną opowieść dźwiękową, w której miasto jawi się jako miejsce niemalże magiczne – mające swoje życie, pilnie strzeżone tajemnice, jasne i mroczne strony. Wszystko to znajduje oczywiście odbicie w muzyce. Tym razem Rohmann rezygnuje w większości przypadków z klubowej motoryki. Lwia część albumu rozegrana jest na epickie partie analogowych syntezatorów, wywiedzione z klasycznej kosmische musik. Otwierający zestaw tytułowy „Dust” rozwija się powoli, z każdą minutą swego trwania wzbogacając się o nowe wątki. Wbrew swemu tytułowi w „Silent Glory” nie ma zbyt wiele miejsce na uspokojenie – bo rozwibrowane arpeggia zostają skontrastowane brutalną falą szumiącego noise’u. Pierwszą część opowieści puentuje „47th Floor” – urywając się gwałtownie w kulminacyjnym momencie narastającego podkładu rytmicznego, opartego na agresywnych breakach. Mechaniczny rytm wybijany w miarowym tempie wiedzie nas przez „Apparition” – wprowadzając ze sobą łagodnie wijące się smugi ambientowych klawiszy. Zupełnie inny podkład znajdujemy w „Far Far Light”. To zapętlone perkusjonalia o jazzowym rodowodzie, wsparte głębokim pochodem basu – które Rohmann zanurza w odmętach kosmicznych organów. 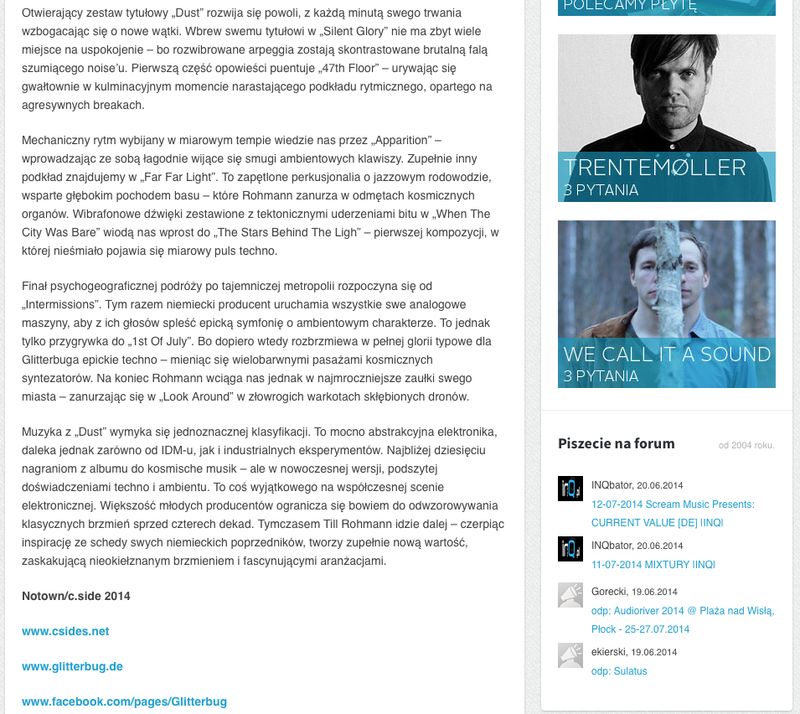 Wibrafonowe dźwięki zestawione z tektonicznymi uderzeniami bitu w „When The City Was Bare” wiodą nas wprost do „The Stars Behind The Ligh” – pierwszej kompozycji, w której nieśmiało pojawia się miarowy puls techno. Finał psychogeograficznej podróży po tajemniczej metropolii rozpoczyna się od „Intermissions”. Tym razem niemiecki producent uruchamia wszystkie swe analogowe maszyny, aby z ich głosów spleść epicką symfonię o ambientowym charakterze. To jednak tylko przygrywka do „1st Of July”. Bo dopiero wtedy rozbrzmiewa w pełnej glorii typowe dla Glitterbuga epickie techno – mieniąc się wielobarwnymi pasażami kosmicznych syntezatorów. Na koniec Rohmann wciąga nas jednak w najmroczniejsze zaułki swego miasta – zanurzając się w „Look Around” w złowrogich warkotach skłębionych dronów. 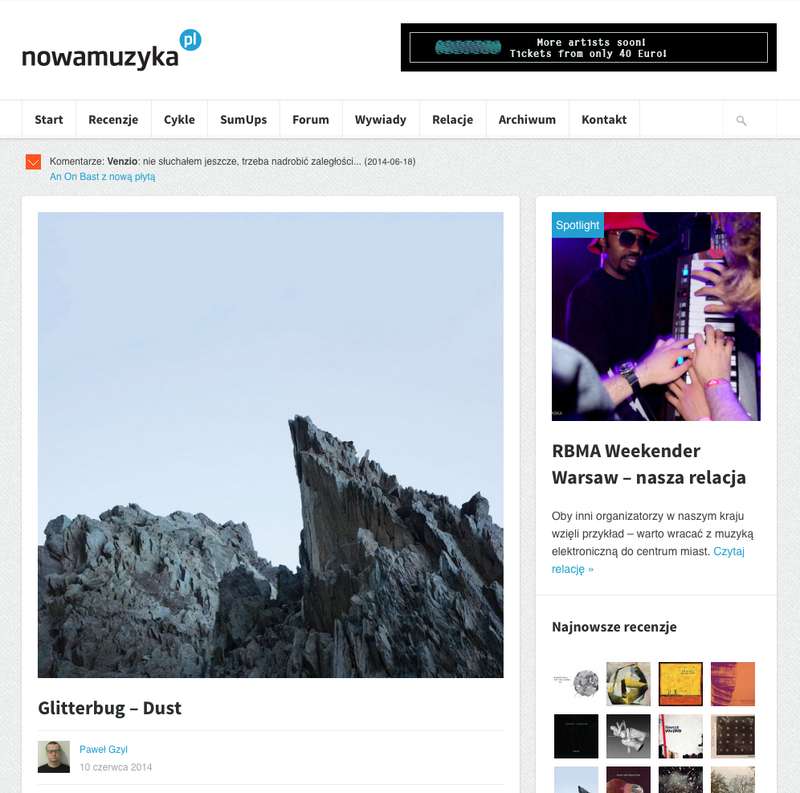 Muzyka z „Dust” wymyka się jednoznacznej klasyfikacji. To mocno abstrakcyjna elektronika, daleka jednak zarówno od IDM-u, jak i industrialnych eksperymentów. Najbliżej dziesięciu nagraniom z albumu do kosmische musik – ale w nowoczesnej wersji, podszytej doświadczeniami techno i ambientu. To coś wyjątkowego na współczesnej scenie elektronicznej. Większość młodych producentów ogranicza się bowiem do odwzorowywania klasycznych brzmień sprzed czterech dekad. Tymczasem Till Rohmann idzie dalej – czerpiąc inspirację ze schedy swych niemieckich poprzedników, tworzy zupełnie nową wartość, zaskakującą nieokiełznanym brzmieniem i fascynującymi aranżacjami. 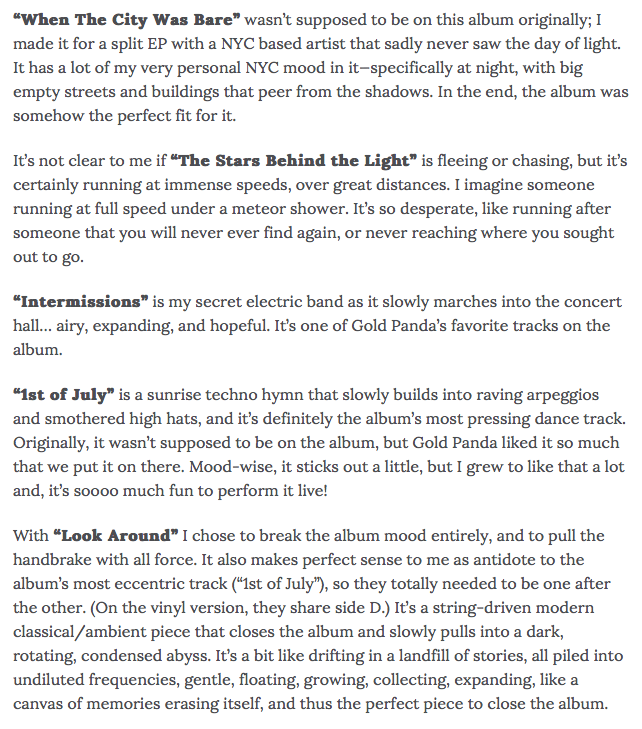 I feel very loved and blessed to not only receive great reviews, but also reviews that are written so beautifully and by reviewers that can obviously find some very deep connection points in my music. 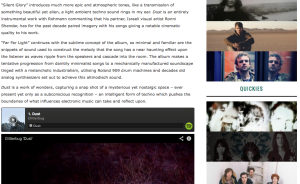 Thank you THEREALMUSIC for such a wonderful and loving review! You can find the original article here. Berlin based Till Rohmann, aka Glitterbug, delivers his mature fourth album on Gold Panda’s label Notown Recordings. 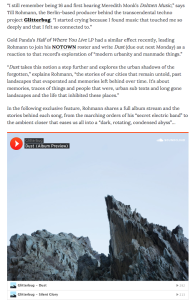 Hinting that the album deals with a real and present dystopia made up of untold stories and forgotten memories: simplistic, banal, everyday things which simply slip through our fingertips, are the very sublime concept which Rohmann attempts to pin down in Dust. 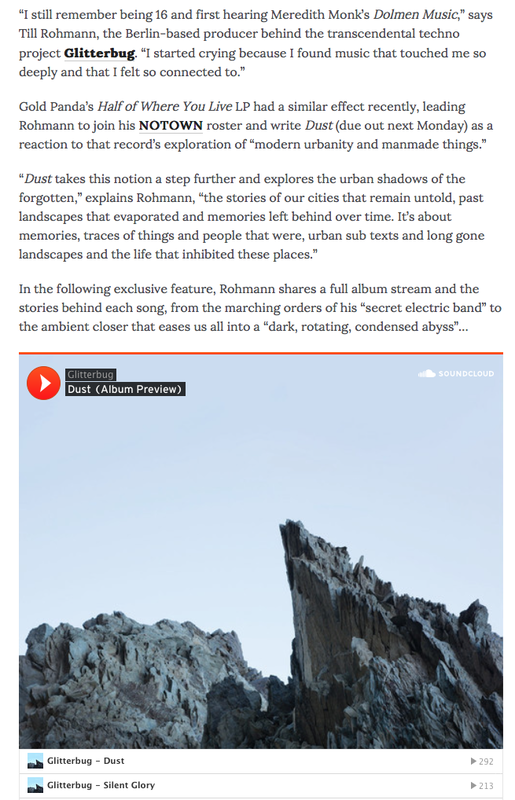 Floating from the depths of silence, minute particles of sound, slowly encircling each other and colliding, a beam of abstract sound is formed cutting through the quiet darkness and illuminating Rohmann’s prowess as a producer. The uniquely composed Dust seems to capture what is only witnessed by the human eye on a bright day and which is otherwise invisible to the naked orb: the tiny molecules of dust dotted in the air, hanging in suspension, swirling on an invisible currents of oxygen. 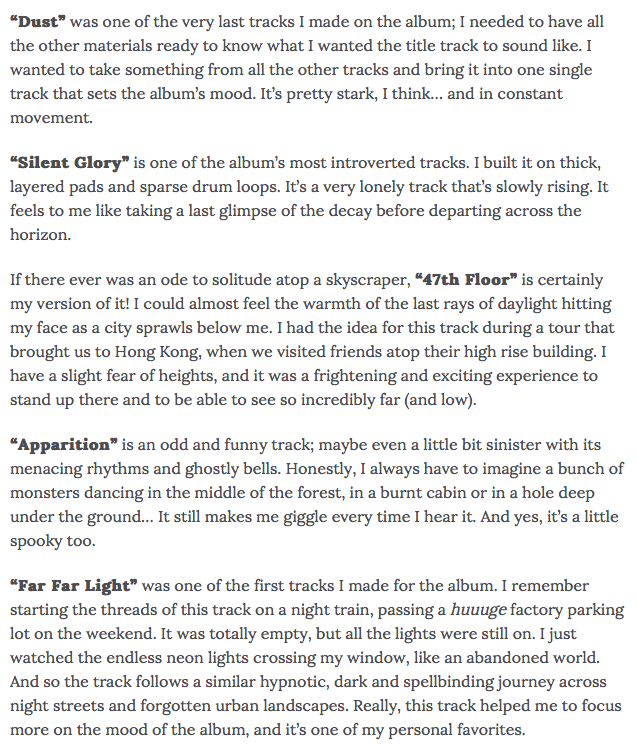 “Silent Glory” introduces much more epic and atmospheric tones, like a transmission of something beautiful yet alien, a light ambient techno sound rings in my ear. Dust is an entirely instrumental work with Rohmann commenting that his partner, Israeli visual artist Ronni Shendar, has for the past decade paired imagery with his songs giving a notable cinematic quality to his work. “Far Far Light” continues with the sublime concept of the album, so minimal and familiar are the snippets of sound used to construct the melody that the song has a near haunting effect upon the listener as waves ripple from the speakers and cascade into the room. The album makes a tentative progression from daintily minimalist songs to a mechanically manufactured soundscape tinged with a melancholic industrialism, utilising Roland 909 drum machines and decades old analog synthesizers set out to achieve this altmodisch sound. 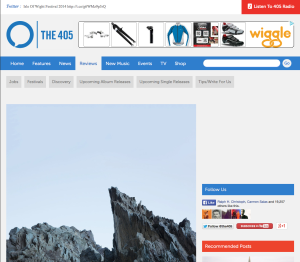 I’m flattered and deeply touched by the wonderful words that the dear people of The 405 Magazine found about Dust. But read for yourself. You can find the original article here. 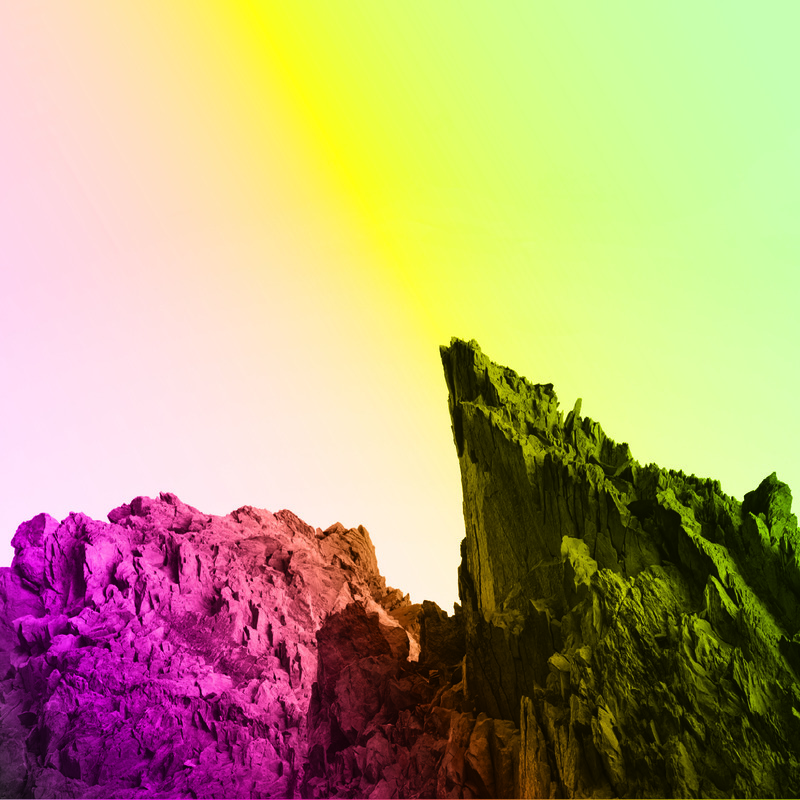 Electronic music has been increasingly interested in suggesting a sense of place, of late. Whether it’s Forest Sword’s incorporating The Wirral countryside on last year’s excellent Engravings; or Emptyset constructing symphonies from dilapidated echoes in a ruined mansion on 2012’s Medium; or the psychogeographical derives through spectral landscapes of The Stranger’s Watching Dead Empires In Decay. In this weightless world of fleeting impressions and passing stimuli, we need something to tether sounds to. 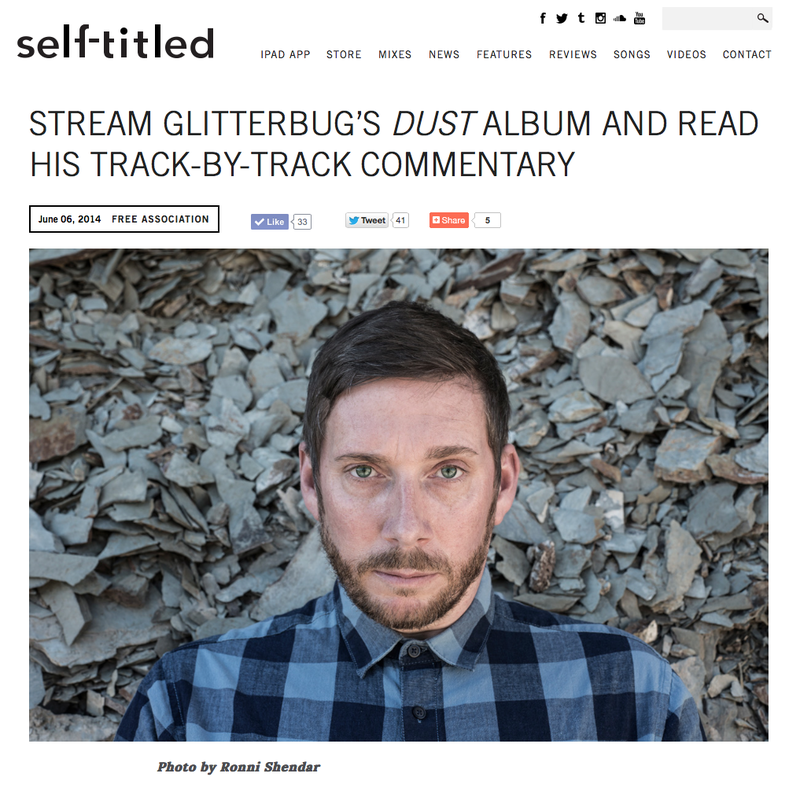 Glitterbug’s last album was a highly introspective and personal affair (2012’s Cancerboy), giving an audio approximation of the producer’s childhood battle with cancer. Since then, Rohmann has hooked up with Gold Panda (signing to his Notown Recordings label) – a move which finds the producer looking outward, setting forth to explore the world. Dust was created, in part, as a response to Gold Panda’s globe-trotting Half Of Where You Live. If that record was a sound diary of a busy year, touring the globe, sleeping on couches – the dance floor equivalent of busy streets and jet lag and culture clash and sensory overload – then Dust is its Twilight Zone counterpart. Those same streets, at 3:32 am, not a person in sight. This is TRANS-personal music, the sound of shadows and dust and phosphorescence and debris, as told by etheric synthdrones and dusted drum machines. What is most striking about Dust is that while it may conjure images of a city at night, it’s not one particular city. This is not a real world travel guide, instead, it is an archetypal city that exists only in your imagination – rife to wander around in, or to soundtrack your own somnambulism. Some of Rohmann’s home town of Berlin has creeped in, mainly in the smooth sailing beats that have earned Glitterbug comparisons to fellow Berliners GAS, but it is still a dreamtime version of Berlin. Dust works best as a soundscape, as an audio diary or ephemeral soundtrack. That is to say, it is best taken whole. It is heavy with atmospheric synth nocturnes and clockwork sequencers, and it works best when you lean back and take it in, like looking at the stars, or watching the bustling, blinkering skyline of a city from a high rise balcony. There’s a few tracks, particularly ‘Apparition’, ‘Far Far Light’, ‘When The City Was Bare’ and ‘The Stars Behind The Light’, that could be culled from the crowd and placed in a light and trancy minimalist mix, for those DJs that want to evoke that frictionless, gliding Berlin futurism. All of Dust is exquisitely mixed – the organ-like synth drones glow like the Aurora Borealis, while the stately kick drums sounds like they’ve been dipped in resin and iron filings and then wrapped in silk. Dust suggests an easy peace between hardware and digital, with Rohmann looking far and wide for the perfect sounds, which are then precisely tooled and set with the molecular precision of digital production. There is a high level of detail, in the production, and it works to create a cohesive environment, to cast a spell and place you under it. While the “city at night” theme is nothing new for a dance record to explore, Dust is unique in how empty of humanity it is. If Burial’s Untrue is the soundtrack of lonely urban isolation, consider Dust the alleys and pools of shadow Burial’s archangel walks through. A perfect soundtrack for broken glass that glitters like constellations, for coming home from the club at 3 a.m. when the streets are like Chernobyl. Dust is a striking achievement, a step forward from a producer who is growing and gaining in strength. Glitterbug is a name to watch, guaranteed. Here’s to forging ahead, and breaking new ground. Here’s to exploring, and here’s to imagination.